CPSC Director General Dr. Ramhari Lamichhane (2nd from left) hands over CPSC plaque to the Deputy Mayor of Busan, Korea Mr. Yoo Jae-soo (2nd from right) during the courtesy visit of CPSC at Busan City Hall, with Mr. Alok Roy, Secretary General, BFIC and Mr. Shailendra Jha, Head of the delegation. 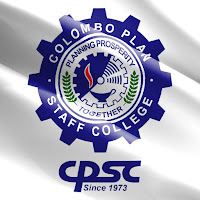 The Colombo Plan Staff College (CPSC) in view of reviving ties with Korea, explores fresh partnership with the Busan Foundation for International Cooperation (BFIC), Republic of Korea, a Busan city government organization established for systematic international relations with world cities. 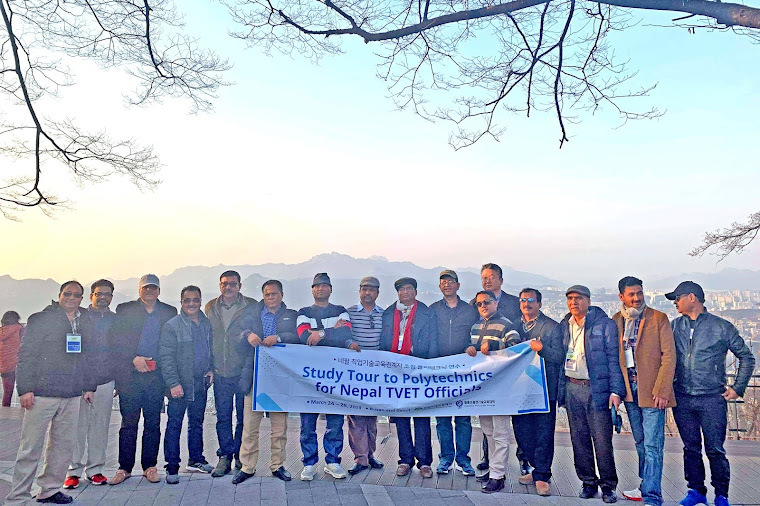 CPSC in cooperation with BFIC organized the Study Tour to Polytechnics and Cultural Places in Korea for 15 heads of the Federation of Private Technical Schools of Nepal from March 24 to 28, 2019. 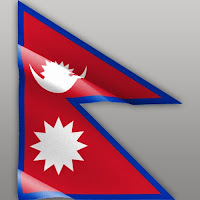 The Federation of Private Technical Schools composed of chairpersons, managing directors, directors and principals of technical institutes in key cities of Nepal, aimed to gain insights on the practices and standards of prime polytechnics and explore partnerships with institutions in Korea. Mr. Alok K. Roy, Secretary General of BFIC, warmly received Dr. Lamichhane and the delegation at the opening day of the program. The DG and the group shared about their institutions including their objectives in coming to Korea. 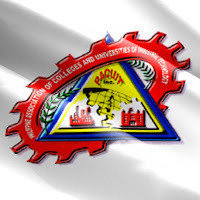 Mutually eyeing to open doors towards strong partnership, CPSC and BFIC expressed their enthusiasm for more collaborative projects in the future. Following the BIFC meeting, the delegation paid a courtesy visit to the Deputy Mayor of Busan Mr. Yoo Jae-soo at the city hall of Busan. The delegation was warmly welcomed by the Deputy Mayor who imparted his good wishes for a successful benchmarking visit for the group. 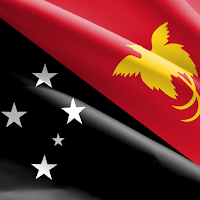 He also looked forward for a fruitful linkage with CPSC through BFIC. 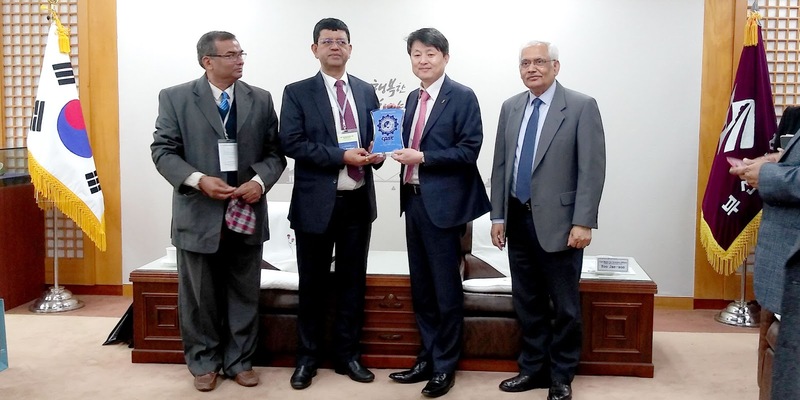 CPSC Director General Dr. Ramhari Lamichhane (1st from left, center) and Busan Deputy Mayor Mr. Yoo Jae-soo (1st from right, center) during the courtesy visit of CPSC at Busan City Hall, with the delegation. 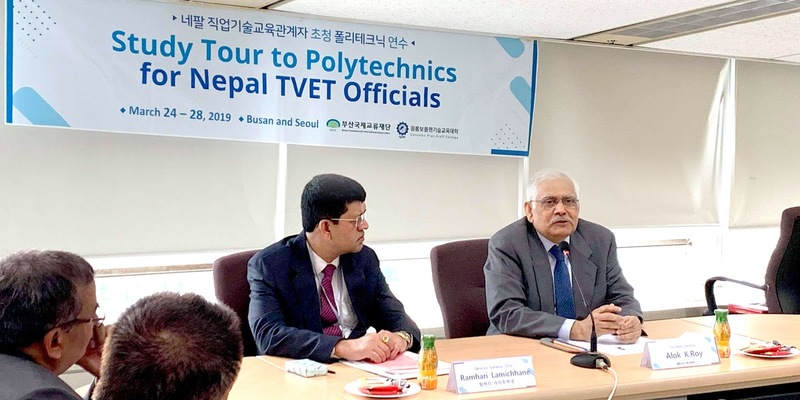 In fulfilling the objectives of the four-day study endeavor, with its first part in Busan, the delegation visited Busan Campus of Korea Polytechnic VI. 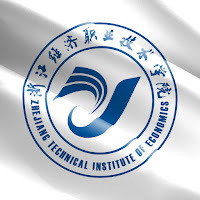 Ranked as number 1 provider of employment in the country consistently for five years (2012-2016), Busan Campus of Korea Polytechnic VI has the vision to be the leader in lifelong vocation development and marked as the future of Korean industry. 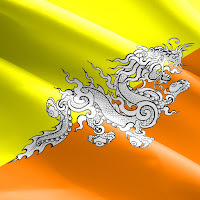 A cultural tour to Gamcheon Cultural Village and Haedong Yonggung Temple was also held in Busan. CPSC Director General Dr. Ramhari Lamichhane (2nd from right, seated) and Mr. 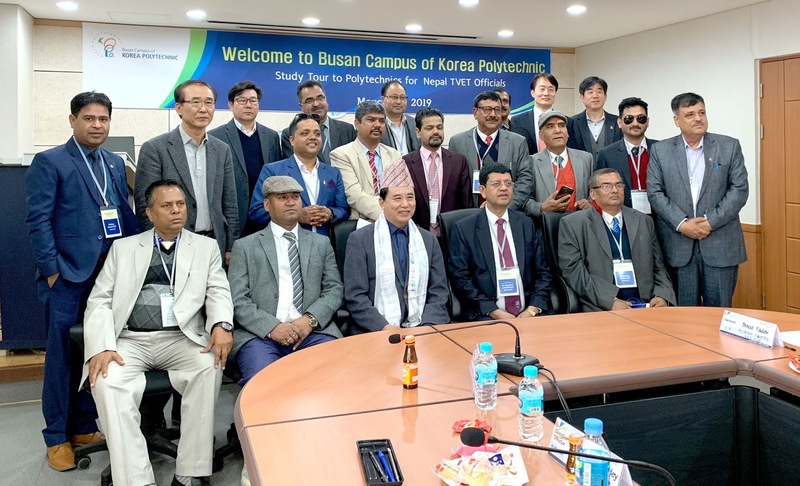 Sung Sik Lee (center, seated), President, Busan Campus of Korea Polytechnic VI with the delegation during their visit to the campus. 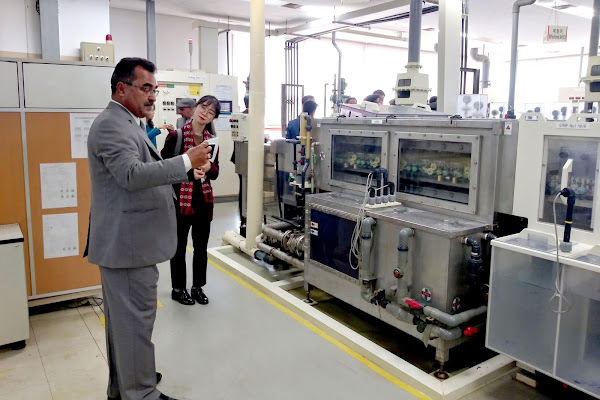 The second part of the study tour was held in Seoul whereby the group learned about the systems of Korea Polytechnic University (KPU) and Global Institute for Transferring Skills (GIFTS). 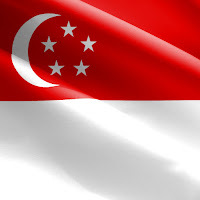 Founded by the Ministry of Trade and Industry and Energy, KPU is the nation’s first four-year university that specializes in university-industry cooperation and is located in Korea’s largest national industrial complex which is home to 19,000 companies. 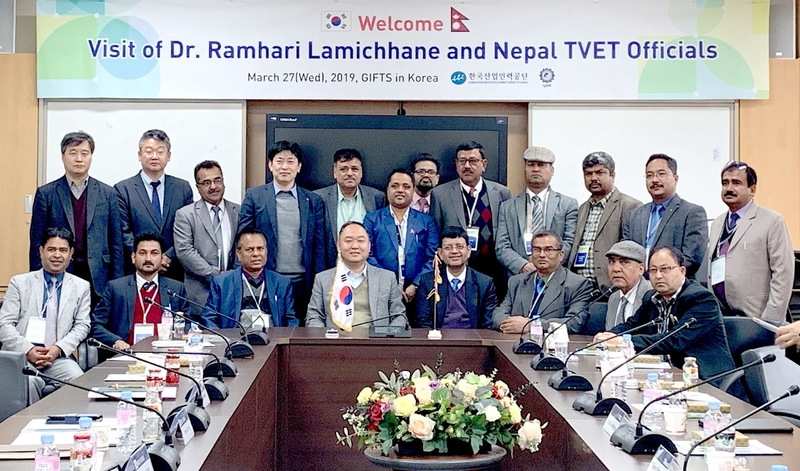 CPSC Director General Dr. Ramhari Lamichhane (5th from left, seated) and Mr. Hong Jea Yong (4th frome left), Director, GIFTS with the delegation during the visit to GIFTS. 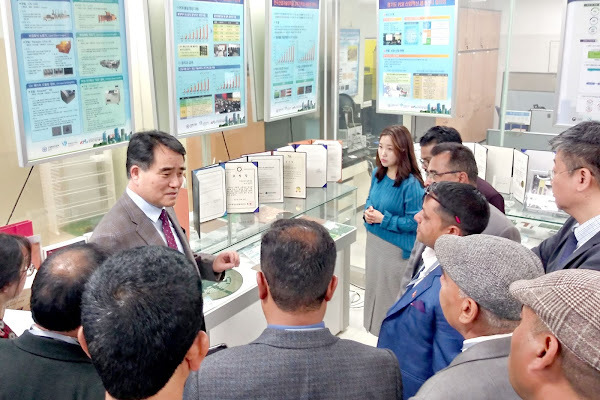 The group also visited GIFTS which is an affiliated organization of the Human Resources Development (HRD) Korea which focuses on international cooperation and skills promotions. The group had a chance to visit Korea’s top tour attraction the Seoul Tower. The participants expressed their appreciation to CPSC and BFIC for the successful conduct of the study tour. 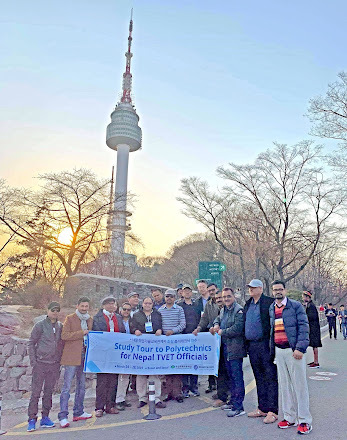 The delegation with the CPSC DG at Seoul Tower.